It rained today in the Bay Area and it was perfect. The day wore on and the weather matched the day and events within. 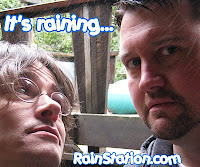 Tonight's song is Rain Station's "Fancy Fancy" from the album of the same title. I've written about this song in the past, but after today's events I found myself drawn to this song...listening intently to the words and feeling the music. You can read what I wrote in the past here....and have a listen below. I'm hoping to have the ability to write about my experiences over the past few days. I've been greatly impacted by this experience.